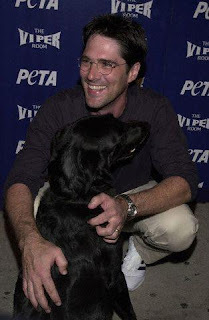 Tom in "Dharma and Greg"
As LOVING MOORE counts down the last nine days until the Season Six Premier of CRIMINAL MINDS, we pay tribute to the fine actor who portrays SSA Aaron Hotchner, Unit Chief of the Behavioral Analysis Unit. "Hotch" is the epitome of an FBI agent, strong, stoic, professional, but utterly humorless. He is a strict leader, and the glue that holds the team together. Hotch is portrayed by Thomas Gibson, who, like co-star SHEMAR MOORE, began in television with roles in the soap operas, "As The World Turns" and "Another World." He went on to star in the prime time series, "Chicago Hope" for three years. Next, he played straight man to Jenna Elfman in the comedy series "Dharma and Greg." His movie credits include "Psycho Beach Party," another comedy role. His role on CRIMINAL MINDS proves that Tom is as proficient as a dramatic actor as he is in comedy. There are many who believe that he should have received an Emmy nod for his work in MINDS, and especially the episode, "100," playing the husband of a murdered wife. In real life, Thomas is as traditional as his character. He and his wife, Christine, have four children and reside in Christine's hometown of San Antonio, Texas. He avoids the Hollywood scene, and spends his spare time playing golf. The actor turned forty-eight on July 3, but has a boyish look when he smiles, that makes him appear younger than his years.